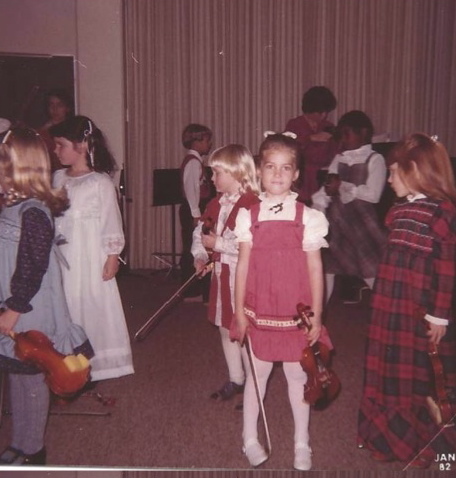 When I was 4 years old, I made a comment to my parents that I wanted to learn how to play the violin. Little did I know that my dad would soon arrive with violin in hand and I would begin taking lessons. Every week my mom would tote me to the local university for lessons, and I was “encouraged” to practice at least 30 minutes every day. Though I do not recall requesting to learn the violin, I distinctly remember what it sounded like the first time I played it. I don’t know why, as a 4 year old girl, I thought that I would pick it up and make beautiful music with seemingly effortless glides of the bow but I can undoubtedly say it was the most horrific, bone chilling, goose bump raising, ear shredding sound my little ears had ever heard. I quickly put it down and went to go tell Mom that I no longer wanted to play. Her reply was “Tough”. She clearly reminded me that I was the one that wanted to learn to play and that I would need to stick with it long enough to learn it, and I must practice every day like my teacher instructed. Don’t give up just because you don’t want to try. Give it everything. A one-time try is the path to failure. Surround yourself with people who will hold you accountable and encourage your success. Be proud of what you accomplish. Never shy away from a challenge. Don’t beat yourself up. You’re learning. These are just a few out of likely dozens (if not more) I could list. When you think about your training plan, reflect on the lessons that you’ve learned along the way and those that maybe need a little bit more attention and work. Don’t expect to be successful on your first attempt, whether it be the first time your feet hit the pavement, the first time you do a challenging workout, or the first race you run. But instead continue to move forward, learn from your mistakes, and realize that exercise is just like a lot of things in life – it takes a little bit of hard work, a little bit of planning, and a great deal of practice.